Another successful envoi branding project brought to market. Build-A-Bear Workshop today unveiled its newest one-of-a-kind collection, Monster Mixters, which allows guests to choose a body, pick legs and grab arms of their choice to truly customize a new furry friend from head to toe. No one knows for sure how Monster Mixters got here. Legend has it, they came from (NAME OF IMAGINARY PLACE), a land far, far away and arrived at Build-A-Bear Workshop in pieces, waiting for monster fans to pick their parts and assemble (ADJECTIVE) Monster Mixters. About one year ago, a group of Hollywood types made their way to the Queen City. They visited our bars and our restaurants, strolling up and down Vine Street, eyeing the historic Italianate architecture of Over-the-Rhine. Turns out, these location scouts from Salt Productions were looking to film another beautifully photographed Todd Haynes 1950’s era movie. You may recall Haynes as the critically acclaimed director of Far From Heaven, Mildred Pierce, and I’m Not There – all films with themes that challenge the notion of an idyllic post World War II Americana. Cincinnati proved to have the right look, and a warm welcoming community, to fit the bill. Carol was coming. In January, Art Department directors for the film consulted with Envoi Design about collaborating together. Our team went right to work designing period correct props including: shopping bags; toy displays; and magazine stand for the Department Store set. Every day, it seemed, there was more work to do. Each scene and backdrop was scrutinized in painstaking detail, but we were only too happy to help construct this magical make-believe world. On December 24th, Carol finally opens in Cincinnati. The film, which stars ill-fated lovers Cate Blanchett and Rooney Mara, has been receiving awards and nominations galore. By all accounts, it will likely find a place among the best cinematic pieces of all time. Envoi Design was lucky enough to have played a not-so-small part in bringing Carol’s story to life. And, we’re pretty stoked that our work will be around for years to come. Like our neighbors and friends, we are looking forward to buying a ticket and enjoying the movie in the hush of a darkened theater. Don’t blame us if we’re busy scanning the screen and searching scenes for tiny glimpses of Envoi Designed art. See if you can find us in there, too. Envoi celebrates Star Wars 2015 by resurrecting a couple of old gems. 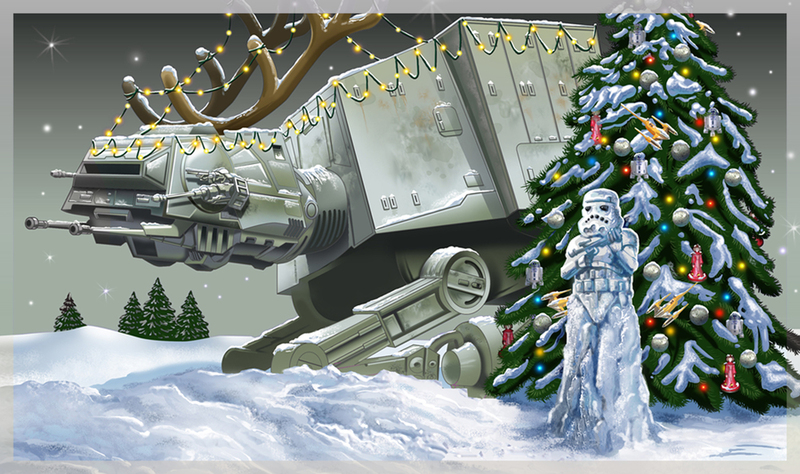 Our designers generated these Winter-themed whimsical depictions of Darth and friends about five years ago. We think they’re worth dragging out of the attic. Envoi Design has once again joined forces with California-based Diggin Active. Our mission was to collaborate in generating effective branding and dynamic package design for Slimeball, a kids' toy that helps to foster a lifelong love of sports and active play. We were excited to conceptualize an unforgettable logo and box, putting together some gnarly, eye-catching graphics for the final product. 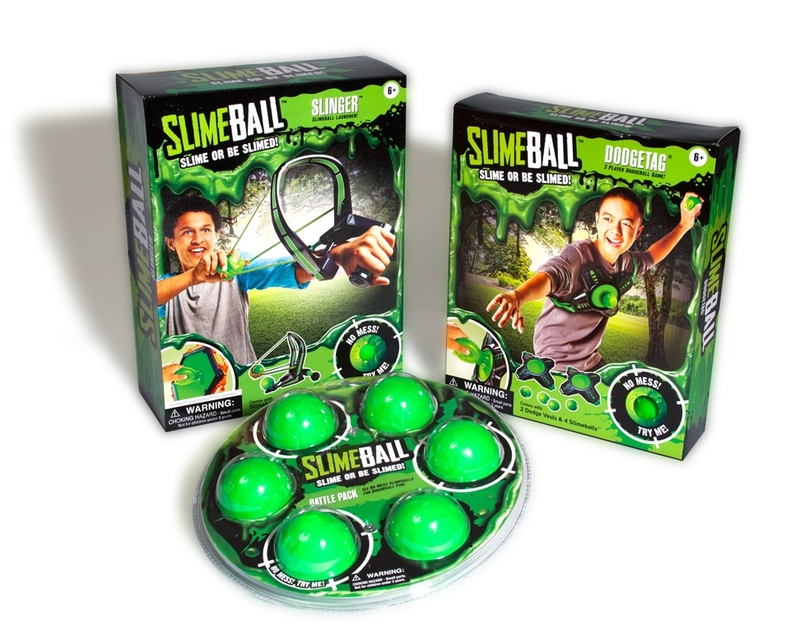 Recently introduced at this year’s New York Toy Fair, the Slimeball line brings gobs of slime fun, slime gear, slingers, and buckets of Slimeballs to kids 6 and older. It's been compared to a real life video game where players get to throw, sling, and dodge Slimeballs in a safe environment, without creating mess. Parents around the world rejoice! Diggin Active specializes in inventing innovative sports toys that aim to help kids stay active. They've developed games in all sports categories since 2006, selling at retailers around the globe, winning multiple industry awards. Their lineup combines great design, great performance, great value, and great fun. Envoi Deisgn is excited to be invited to partner with Diggin. The City of Cincinnati sits at the forefront of municipal technology. As proof, officials unveiled a mobile application in 2013 that would help connect residents with useful municipal services. This app was created to enable concerned citizens the ability to quickly and easily request services from the departments of Sanitation, Health, and Parking Enforcement. Cut to early 2015; enter Envoi Design. The City of Cincinnati invited our team to bring innovation and optimize communication through a re-design of the services mobile app. Envoi Designers accepted the challenge and began working with developers to generate a new and improved “Fix-it-Cincy” mobile application. First, we streamlined the interface, making it more user friendly and efficient. Next, we introduced easy social media sharing, a quick look window, and push notifications to alert users of important updates. Finally, individuals were offered channels to send photo documentation of complaints directly to the city's Customer Service Request system. We designed these Fix-it-Cincy changes to increase resident engagement with city services, and to motivate users to get more involved in maintaining their communities. Certainly, it takes cooperation and pride for a place to thrive, but it also takes access and responsiveness. By providing transparency in service scheduling and allowing for resident feedback on work quality, Fix-it-Cincy creates a vital space for collaboration between officials and constituents. Envoi Design is grateful to play a role in achieving progress on behalf of Cincinnati. This is our city, too, and we love finding ways to make it better! Our friends at Faces Without Places have grown and evolved into what is now called UpSpring! Envoi Design had the distinct privilege of building their new website to represent this grand transformation. The fresh look and the new name were recently unveiled during Faces Without Places' annual Summer Celebration at Contemporary Arts Center in downtown Cincinnati. Special guests including Cincinnati Mayor John Cranley, Ohio 9th District Representative Christie Kuhns, and numerous longstanding supporters gathered to show their support for this new phase in the organization. Founded in 1998, Faces Without Places served as the Cincinnati region’s only nonprofit dedicated to providing educational services for children experiencing homelessness. More than 4,000 children have benefited from summer camp programs, mentoring, and direct services. UpSpring will continue the tradition of providing much needed community service, while also working to expand reach and impact. Envoi Design is honored to support this great work! 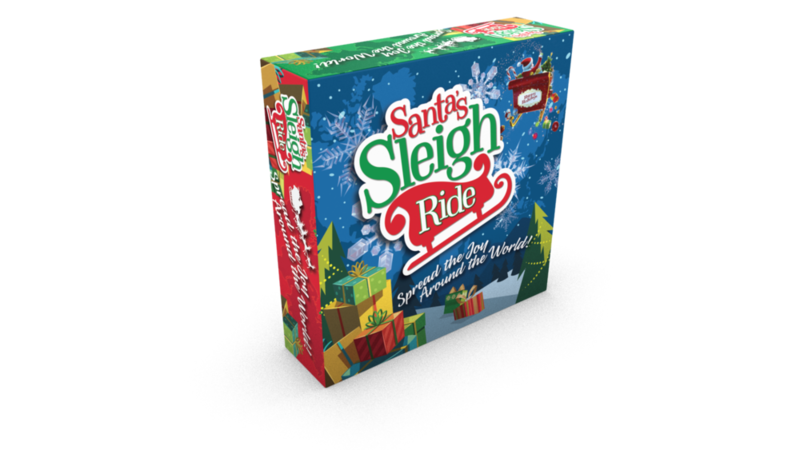 Santa’s Sleigh Ride is taking off! 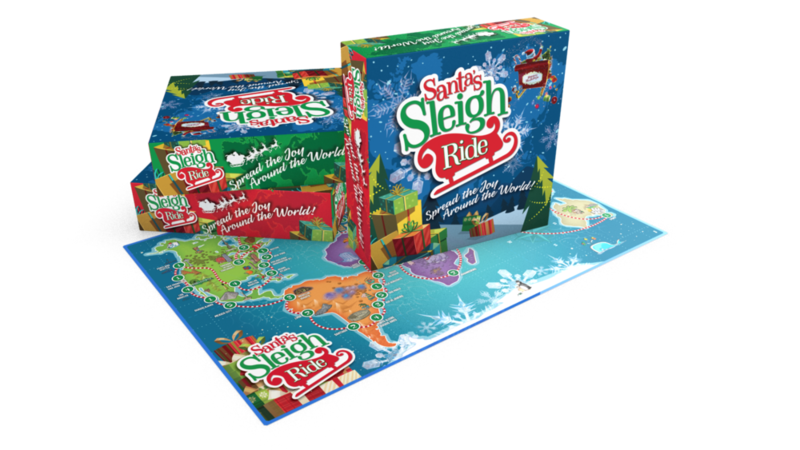 Congratulations to all who contributed to Santa’s Sleigh Ride. This morning we had the honor of hosting the Cincinnati Toy and Game Industry group breakfast at Envoi. Thank you to everyone who attended. We had such a great time meeting you. We are lucky to be a part of this vibrant, creative, and talented community and look forward to staying in touch and seeing you all again soon. If you couldn't make it to this one, join us for the next one! Katie Fine is known for her fearlessness, having bungee jumped some 180 feet from a crane, performed stand-up comedy to a full house at Go Bananas, and moved solo to the Bavarian Alps for a year. She is the kind of person who enters a karaoke contest on a whim, and ends up winning the grand prize. She joins Envoi Design as Senior Account Manager and is hoping to continue pushing the boundaries of convention on behalf of her clients. Katie is ideally suited for this role, given her solid background in communication and ability to problem solve. Katie is a proud graduate of the University of Cincinnati, receiving both Bachelor’s and Master’s degrees in communication, eventually teaching there. Over the years, Katie has served as an educator, recruiter, and account manager—acquiring beneficial skills in public speaking, relationship building, and client management along the way. She is grateful for the generous mentors and inquisitive students who’ve contributed to these essential learnings. Katie is also known for her passionate support of all things Cincinnati, lending support to causes including League for Animal Welfare; Girls on the Run; and Ronald McDonald House. She lives in historic Over-the-Rhine with husband Gene and rescue dogs, Shelly-Bean and Gary. Zing Toys launched a website and never felt that it captured the personality and spirit of the brand. The challenge for Envoi was to work within an established content management/grid structure, and push the envelope for visual impact and interactivity. How'd we do it - we incorporated big, bold lifestyle images; rollovers; animations. We pushed the images to the edge of the grids, and incorporated uniques brand identities for the individual pages. The result: A great new website, garnering rave reviews, longer viewing times, and a lower bounce rate.